Super7 is in full swing for 2019 with their new GHOSTS’ N GOBLINS REACTION FIGURES, which are based off the 1985 side-scrolling Capcom arcade and home video cartridges. This game features a knight, Sir Arthur, battling hordes of zombies, gargoyles, and other creatures in a quest to save Princess Prin-Prin from the evil demon King Astaroth. One thing that sets this game apart from others, even today, is a difficulty level that causes blisters from hours of smashing the controller buttons. 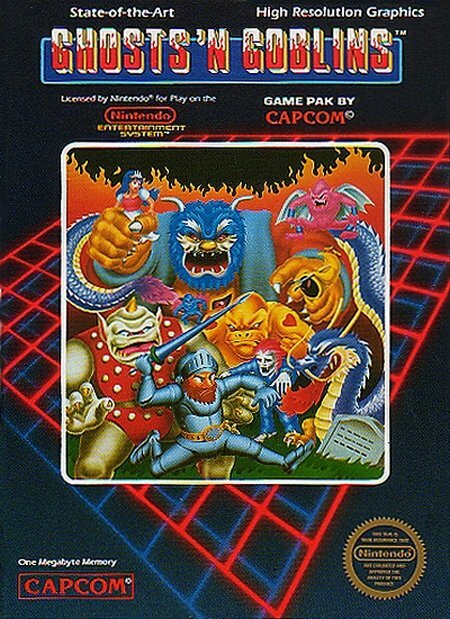 Ghosts’ n Goblins also featured the Japanese humour that Capcom had become known for; if you got hit by a creature attacking Sir Arthur, for instance, he could find himself knocked out of his armor and running around in his underwear.This game not only helped bring zombies into arcade games, but also helped spawn many sequels, which were all pretty successful. Capcom then went on to release games such as Mega Man, another fun and popular series..
Super7 has assembled some of the best characters from the game in two 3-character packs (complete in retro packing that pays homage to the game) and also Sir Arthur on his own in magical gold armor (based on the Japanese version of the video game). 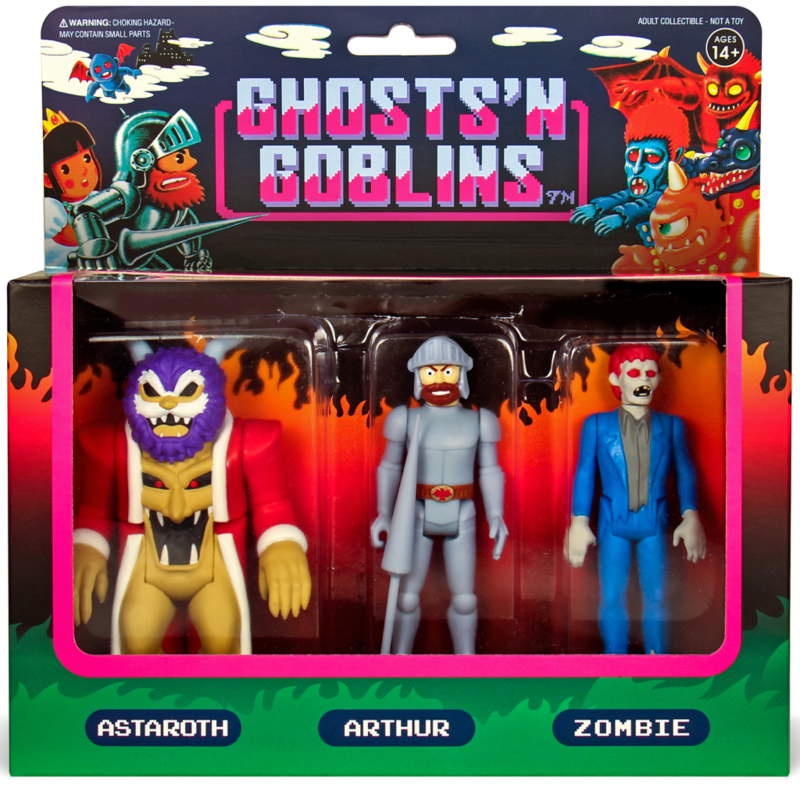 Pack A Ghost n’ Goblins ReAction figure pack features three 3.75 inch articulated retro figures. The figures included in this set are Astaroth (the main bad guy), Arthur (in his grey armor) and zombie (one of the undead horde). 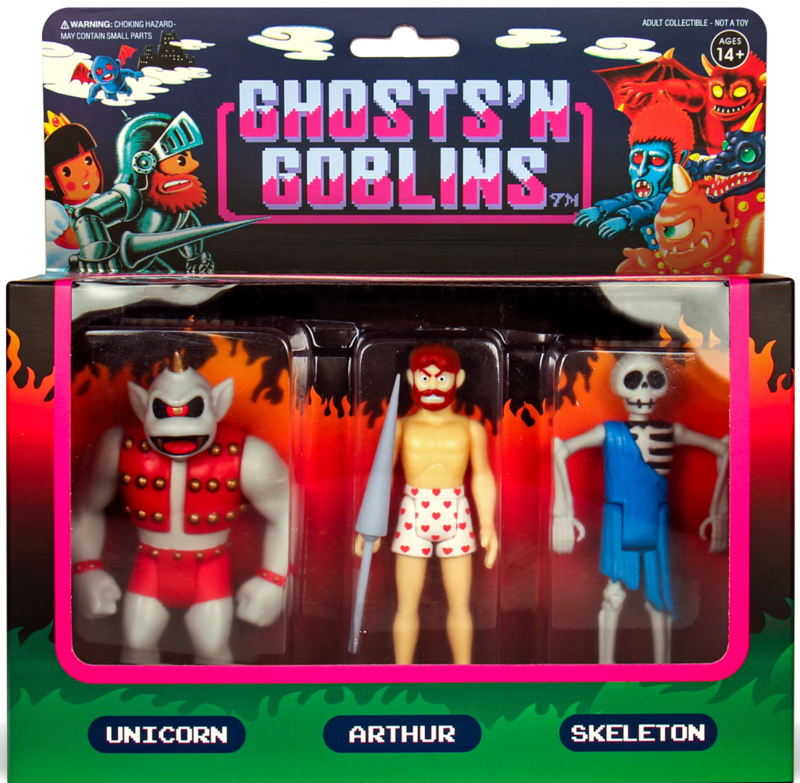 Pack B features Unicorn (Gargoyle), Arthur (in his underwear with little red hearts pictures on them), and Skeleton (one of the undead horde). Finally, Sir Arthur is featured by himself in his gold magical armor, straight out the Japanese version of the game called “Daimakaimura”. 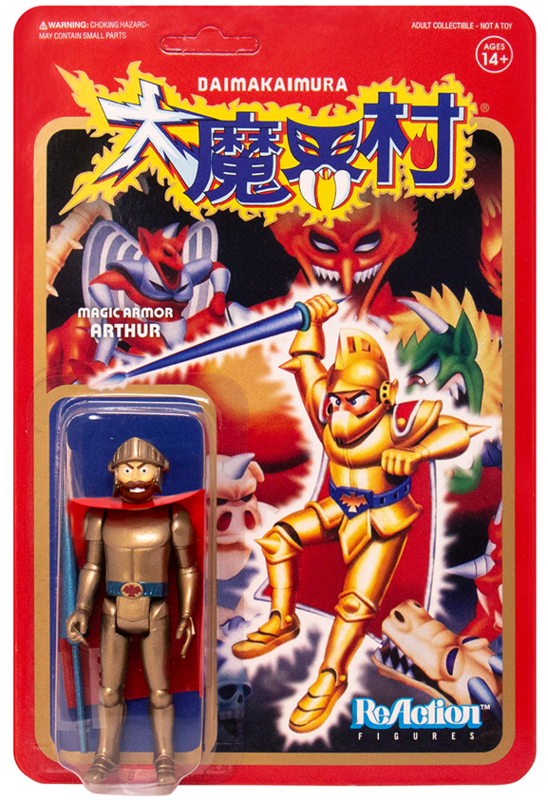 The card back on this figure is dazzling, featuring a pretty close depiction of the original platform release in Japan (showing Arthur in his Gold Armor). Collect more from SUPER7 including products from ALIEN, HELLBOY, HEAVY METAL, IRON MAIDEN and fill the display cases with awesomeness.